What do we know about the person? On August 18th, 1894 she was born in the Austrian village Tattendorf. The village is located around 35 km south of Vienna. In 1894 it had around 800 inhabitants. Thekla Pfneisl, a day-labourer (1872-1933) was her mother. Her father was Josef Neuzil (1863-1902), an elementary school teacher. Neuzil originated from South Bohemia and has been working as a teacher in Lower Austria since 1887. The girl was baptized in the village church of Tattendorf and named „Walburga“. On March 11th, 1895 her parents got married and she got father´s family name. Wally had four sisters: Anna Emilia (1892-1981), Antonia (1896-1962), Maria (born 1898) and Berta (1900-1968) and two (half)-brothers: Johann (born 1904) and Ernst (born 1910). From 1896 on Josef Neuzil was a teacher in different schools. From September 1901 on he was the head of the elementary school in the village Sparbach in the „Wienerwald“. In February 1902 Josef Neuzil died in the hospital of Mödling in Austria. His wife Thekla, her mother and her five daughters moved to Vienna then. They frequently changed their accomodation and lived in the rather poor areas in the capital of the Austrian-Hungarian empire. As an official´s widow Thekla got a pension until her death in 1933. In 1911 Wally Neuzil met the painter Egon Schiele (1890-1918). It is somehow a common myth, that the painter Gustav Klimt „donated“ his model Wally to Schiele. But this seems very doubtful. Klimt did not work with very young models at this time and there is no work by Klimt known showing Wally Neuzil. From 1912 on Wally was frequently drawn and painted by Egon Schiele. But she was more than a model for him. She was his muse, his darling („Liebling“) and maybe also his accountant. ​It is sometimes assumed that the social status of artist´s models in the early 20th century is close to those of prostitutes. For some of them, this might be accurate. It is evident that Schiele also has drawn such models „from the street“. But there is another category of models of Egon Schiele: persons from his personal environment. He also has painted his sister Gerti naked. Wally is a part of this category. She was widely accepted by Schiele´s patrons and lived with her mother in a family, which can be categorized as conserative and catholic. After finishing his studies at Vienna´s Academy of Fine Arts Vienna Egon Schiele moved to Krumau (now: Český Krumlov), the hometown of his mother in South Bohemia. Wally Neuzil lived with him there and their wild marriage is said to be one of the reasons why Schiele had to leave the bourgeois city. After leaving Krumau Schiele rented a house in the city of Neulengbach (around 40 km west of Vienna). On April 12th, 1912 Schiele was arrested under the allegation that he had kidnapped and dishonoured the underage girl Tatjana von Mossig. He was imprisoned in the Cell Nr. 2 in Neulengbach (which is meanwhile a monument for the artist). He was in jail for three weeks. In the trial, he was acquitted for kidnapping and dishonouring, but sentenced to stay in jail for three days for showing unethical drawings to minors. In this difficult period, Wally assisted him and helped him very much, as he admired. She brought him the materials to make his famous thirteen prison drawings (now in the collection of the Albertina in Vienna). Once she also brought him an orange that he painted: „The one orange was the only light“ he wrote on the drawing. In 1912 Egon Schiele also painted his Selfportrait and the Portrait of Wally Neuzil (both of them now in the collection of Leopold Museum Private Foundation in Vienna). These two paintings can be seen as a painted engagement. The close relationship from Wally Neuzil and Egon Schiele lasted until 1915. In 1914 Schiele started to show interest in two girls from his neighbourhood, Edith and Adele Harms. He decided to marry, but as he writes in a letter „maybe not Wally“. Finally he decided to marry Edith Harms in June 1915 shortly before he attended the Austrian Army in Prague. There are reports about a last meeting between Wally and Egon in a Café in Vienna´s district Hietzing. Schiele told her that he was going to marry Edith. It is said that he has also made the proposal, to spend a few weeks with Wally each summer. This was not acceptable to her, so she didn´t agree and left him. There are some signs that she was angry about that. Wally Neuzil signed up as an auxiliary nurse and served in various military hospitals in Vienna. In August 1917 her mother Thekla signed a registration form („Meldezettel“) saying that Wally is moving to Sebenico in Dalmatia (today Šibenik). She arrived there around her 23rd birthday. It was certainly very impressing for an Austrian girl to arrive in this amazing mediterrenean town. Dalmatia was a part of the Austro-Hungarian monarchy untill the end of the First World War. Unless the other parts of today´s Croatia, Dalmatia was part of Cisleithania, the Austrian part of the Austria-Hungary from 1867 to 1918. There are very few remains from Wally´s months in Dalmatia. 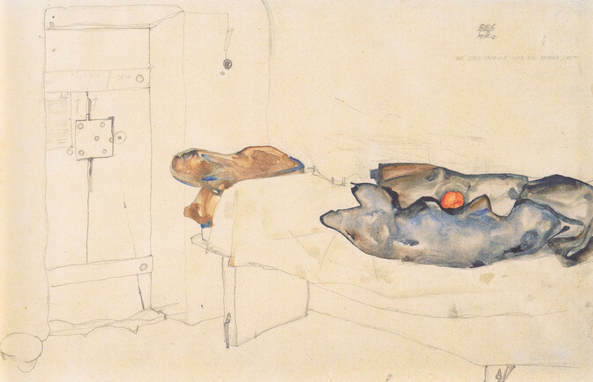 It is documented that Egon Schiele´s collector and paternal friend Heinrich Benesch (1862-1947) wrote a postcard indicating her as a nurse in the military hospital in Sebenico/ Šibenik. Benesch was an important official („Zentralinspektor“) of the Austrian railroad company k.u.k. Südbahn. This postcard also is the proof, that her remains were sent to Vienna after Wally´s death. 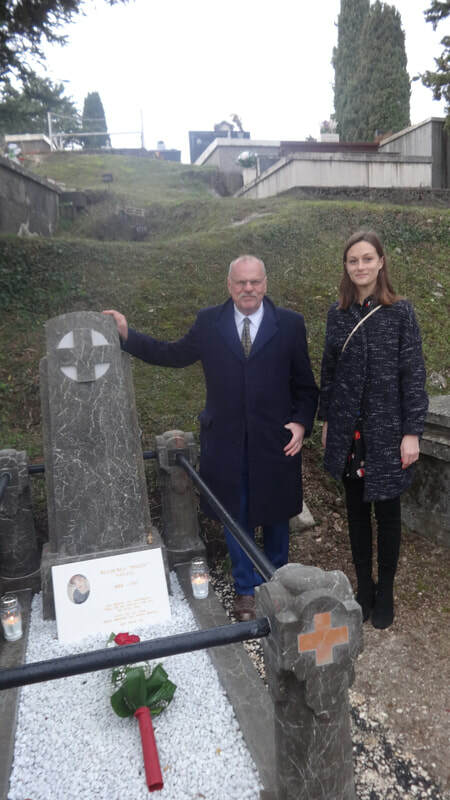 After serving in Sebenico/ Šibenik Wally was obviously transferred to Sinj and served in the military hospital of the regional defense force, named „k.. k. Landwehr-Marodenhaus“. As we see from one of the very rare documents in the Austrian state archives (Kriegsarchiv) she was serving there under the Commander´s office. 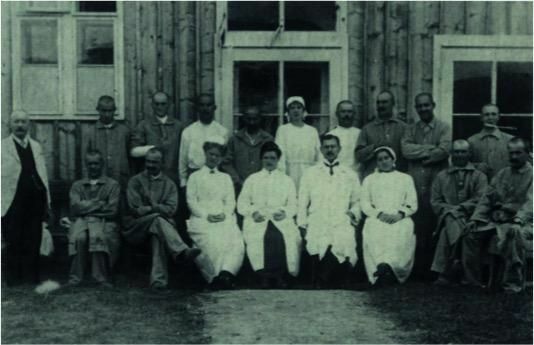 One of the most important sources on Wally Neuzil in Dalmatia is the photograph showing her standing in front of a military building surrounded by nurses, doctors and patients. ​On December 25th of 1917 Wally died in the military hospital of Sinj from scarlet fever. According to the Death Book of the city of Sinj she was buried in St. Francis Cemetery on December 27th. 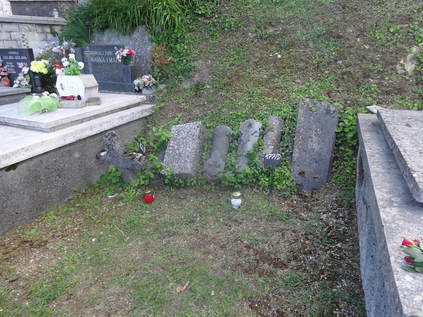 Wally was buried in an already existing grave. In August 1914 the Austrian officer Franz Schön had been buried there. The military department of the Austian state archives in Vienna hosts his personal record. According to this he was born in 1877 in Vienna. He signed up in the Austrian army as a reserve officer in 1897. In 1905 he was appointed „Leutnant“. In civil life has was a pretty well-paid private official. When the First World War started, he was called to the unit „Landsturm-Bataillon 23“ which marched in direction of Mostar. On the way he got sick from dysentery. He was admitted to the military hospital in Sinj and died there on August 30th (according to the tomb) or 31st (according to the personal record). It is completely impossible that Wally Neuzil and Lt. Franz Schön ever met. They never had a love affair, as romantic rumours might assume. Franz Schön´s and Wally Neuzil´s grave was later devastated and was restored until the 100th anniversary of her death this year.